“This is just how things work” is a plague of short-term thinking that is nearly inescapable over the course of a human lifetime. It seems to be our default setting; however things are now, during our life, is how they should and will continue to be, although history has taught us that this is 100% incorrect 100% of the time. The sheer madness of our current fiscal system is aided and abetted by this notion that because it has worked this way for decades, it must be okay, it must be sustainble, somehow. It’s not. 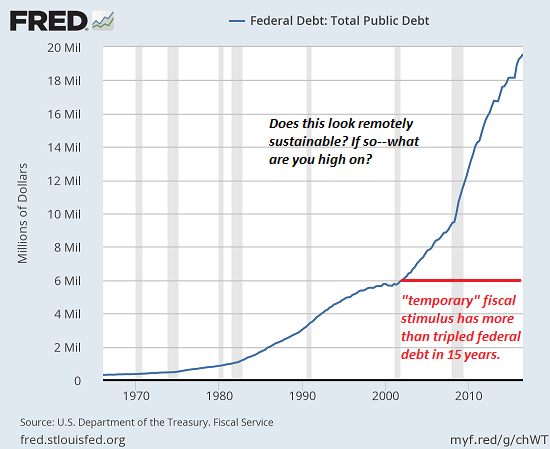 Fiat unraveling is inevitable, and the recent slash-taxes-ramp-spending binge seem to have been concocted by someone determined to bring the system down as fast as possible. Systems fail for a wide range of reasons, but I'd like to focus on two that are easy to understand but hard to pin down. 1. Systems are accretions of structures and modifications laid down over time. Each layer adds complexity which is viewed at the time as a solution. In short order, insiders and outsiders alike habituate to the higher complexity, and everyone takes it for granted that "this is how things work." Few people can visualize alternatives, and any alternative that reduces the budget, payroll or power of the existing system is rejected as "unworkable." In this set of incentives, the "solution" is always: we need more money. If only we had another $1 million, $1 billion or $1 trillion, we could fix what's broken. But increasing the budget can't fix what's broken because it doesn't address the underlying sources of systemic failure. 2. The organization is incapable of instituting deep reforms due to organizational sclerosis and leadership who only wants to hear "good news." Organizational sclerosis isn't just the result of insiders clinging to their job; the structure itself has lost the feedback loops and accountability needed to radically restructure a failing organization. Since failing systems are incapable of structural reform, collapse is the only way forward. Unfortunately collapse doesn't guarantee success; if the rot is deep enough, the wherewithal to assemble a new and more sustainable system may be lacking.